Does your company empower its employees to act as brand ambassadors on social media? Isn’t it about time? The movement, known widely as “employee advocacy,” has gained great momentum in recent years. Companies that choose not to embrace it miss out on tremendous opportunities to amplify their messages, increase the authenticity of those messages, and better rally their employees around the pursuit of the brand’s vision. Roope Heinilä is a respected industry leader who’s been spreading the “employee advocacy” gospel for years. He’s the CEO of Smarp, an app that powers employee communication, advocacy, and engagement programs. Roope agreed to talk to me about employee advocacy and offer tips for making it work. You’ll learn a lot about this important topic in the 10-minute interview below and a transcribed version of the interview that follows. 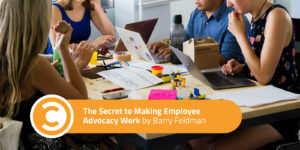 Barry: What is employee advocacy? Roope: Employee advocacy at its core is about employees promoting the brand that they work for. It’s pretty much about turning employees into brand ambassadors for their employers. Of course, employee advocacy as a concept has been around for ages, but with the advent of social media, employees’ ability to affect a large amount of people has really gone up quite a bit. Now they’re able to affect hundreds, if not thousands. Barry: I’ve gathered that a marketing department taking up social media all by itself is often too small of an effort. Is employee advocacy a way to amplify the company’s messages? Roope: If you think about social media—any of the networks, LinkedIn, Twitter, Facebook, etc.—they’ve all really been built with the relationship between people at its core. Facebook was not built to connect companies and people to each other—it was built to connect people. What employee advocacy does is it allows companies to tap into that connection that people have and to actually humanize their brands that way and really utilize the core elements of the social network for both the personal benefit of the employee and for a business benefit. Barry: Making the company’s voice louder and increasing reach is one benefit, but are there others? Roope: Yeah, it definitely shouldn’t be just about increasing our reach. More important than reach is the authenticity. If you think about it from a personal perspective, which one do you trust more: a message coming from a friend or a message coming from a brand? In addition to just getting the authenticity there, you’re also able to engage your employees and really make them be part of the brand, so that brand is shaped by the employees, not the other way around. This is very much a core part of employee advocacy. It’s about getting your employees to be your brand. And that impacts not only marketing, but it impacts communications—even HR—through better employer branding, recruiting, and, most importantly, it impacts the engagement that your employees actually have with the brand. Through an employee advocacy program, they become more engaged through engaging with branded content—actually understanding what the company stands for, understanding its mission, its vision, its future. Barry: That’s interesting. It’s sort of a morale builder. Roope: Yeah. Today’s companies are pretty much people and laptops. The only thing of value is the people in the company. If you think about it that way, you should really be getting those people to be your brand. No matter what you do, they will be a part of it. Barry: So I buy in. I have, let’s say, a mid-sized company, and I love the idea of having advocates across the company. What are my challenges for getting started? Roope: First off, you’ve got to rethink the whole concept. Instead of thinking about what I was just talking about from brand perspective, think about it from an individual employee’s perspective. Why would you, as an employee, want to take part in employee advocacy? That’s where your own professional branding, personal branding, increasing your awareness in your networks, as well as furthering your own career comes in. The first challenge and the biggest challenge is always getting employees on board. The way you do that is by actually making the whole employee advocacy program be employees-first, which means that from a company’s perspective, first off think about, how does this help my employees become better at what they do, and how does this help their careers? Barry: The people that you are trying to onboard—are they bound to be 100 percent willing? Roope: You should only aim for the willing ones. There are many ways of doing it. We’ve seen companies start with large amounts of people, and we’ve seen companies start small. Both of those have their ups and downs, but the key thing in both of them is that it has to be completely voluntary participation. Otherwise, when you’re trying to boost engagement, when you’re trying to turn your employees into brand ambassadors, you might be doing the exact opposite. Roope: That doesn’t work. You might get some short-term benefits, but in the long term, you’re just going to be hurting your company. You should still provide everybody the opportunity to become advocates, provide the training that’s needed, and also, probably most important from the company’s perspective, recognize the people who choose to be advocates. Barry: It makes me think of an ironic mind shift, because here management is making some decisions to put a program in place and train people and onboard people, whereas just a few years back, it seemed like the executive suite would have walked up and down “cubicle row” going, “What are you doing on Facebook? Get back to work.” So is there a mind shift taking place in terms of attitudes about social media? Luckily, a shift has happened over the last five years, where companies are now seeing social and their own employees much more as an opportunity than a threat. To me, it’s very weird that companies have been willing to hand their brands over to celebrities, to brand ambassadors, to customers, but not to their own employees before. How can you trust your customers, trust professional advocators, trust athletes, etc., with your brand if you’re not going to trust the people who created that? Barry: I’ve asked you some questions about how to get started. What happens next in an employee advocacy program? Roope: Hopefully you will have been able to engage your employees in the program. You’ll have a lot of employees sharing, creating your messages, really staying up-to-date on all the latest company news. I believe the next stage is that, instead of just providing them the news, providing them the content, that we engage our employees in curating that content. I believe the knowledge in companies does not just come from the communications department or the marketing department. It comes from the actual employees working in product development, working in sales, working in any of the core functions in your company. If companies are truly shaped by their employees, that shaping should not be limited to employees just “parroting” your marketing messages, but becoming a part of creating them.